September 2017. 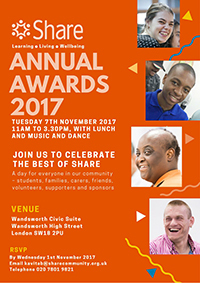 Share Annual Awards 2017 coming up. 'Firsts' for Go Anywhere, Do Anything. Independent living at Share's Open Day. Promoting healthy living. Student focus: Djuna. Volunteering at Share. Job opportunities at Share. Our student stories and achievements are what make Share what it is...and, often, it is the little changes that we see in our students' lives that are the most significant, and it is these that we celebrate everyday at Share. Our Annual Awards Ceremony, which takes place on Tuesday 7th November 2017, from 11am to 3.30pm, is our opportunity to share those celebrations with our supporters as well as our students and their friends and families. So we'd like to invite you to join us to help us celebrate the best of Share with a spot of lunch, and some music and dance...oh and a little Zumba, thanks to our friends at Disability Sports Coach. or telephone 020 7801 9821 to book your place. Share's Go Anywhere, Do Anything project celebrated a number of firsts this month – members went on their first overnight trip – camping, no less! And then they took to the tracks for their first international trip to Paris on the Eurostar. Having received funding for a further three years, we're now looking to providing even more opportunities for our students further afield, and our aim is to run 20% of trips outside of London during this time. Find out more about these Go Anywhere, Do Anything trips and check out what's on the Go Anywhere, Do Anything calendar for the next few months. To find out more about Share's Go Anywhere, Do Anything project, contact Leanne Wood, Share's HR, Projects and Volunteer Manager, via email leannew@sharecommunity.org.uk or telephone 020 7801 9825. 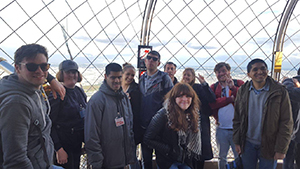 The focus for this year's Open Day held earlier in the month was our Independent Living Skills programme, which we've revamped to cater for the changing needs of our students. To find out more about Share's Independent Living Skills programme, contact Mikayla Mighton, our My Life Manager, via email mikaylam@sharecommunity.org.uk or telephone 020 7801 9813. If you were unable to come along to our Open Day, but would like a copy of our information pack, please contact Jane Wingfield, our Wellbeing Administrator, via email janew@sharecommunity.org.uk or telephone 020 7801 9812. 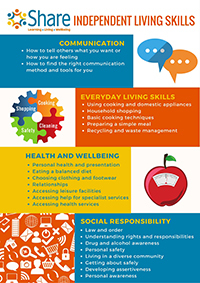 Share's health and wellbeing programme continues to go from strength to strength – working with those in the local community to promote healthy eating and exercise among our students. Over the past few weeks Share students took part in Tesco's Farm to Fork Trail (part of Tesco's Eat Happy Project) at Tesco Brixton to learn all about healthy eating. And then they headed off to Battersea Sports Centre to get fit with the help of Disability Sports Coach for Share's Sports Day. 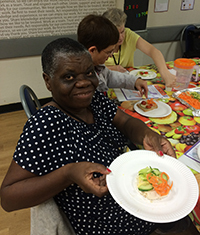 To find out more about our healthy living programme, contact Jenny Bourlet, Share's Healthy Living Coordinator, via email jennyb@sharecommunity.org.uk or telephone 020 7801 9813. This month, we'd like you to meet Djuna. 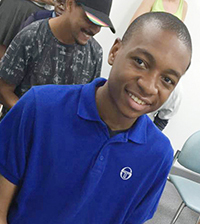 In the relatively short time he's been at Share, it's been a joy to see him grow in confidence and stature as he finds new ways to communicate, express himself, develop his skills and unlock his potential. 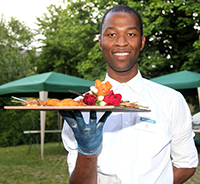 Read Djuna's story to find out how he's getting on in our catering, basic skills and creative writing courses, and even getting out and about with Go Anywhere, Do Anything. 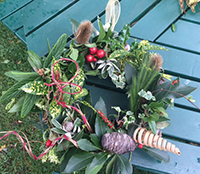 The Share Gardening team have been getting creative – and have designed some beautiful festive wreaths for the Christmas period. We are now taking orders for Christmas wreaths for collection from late November through December. Wreaths are priced at £12.50 to £15 per wreath. Orders can be placed until 15th November 2017. And we're requesting that you pay a small deposit when ordering your festive wreath. To place your order, contact Sarah Bailes, our horticulture training manager, via email sarahb@sharecommunity.org.uk or telephone 07837 180 774. There's nothing like eating a piece of cake! To find out more about volunteering and volunteering opportunities at Share, contact Leanne Wood, Share's HR, Projects and Volunteer Manager, via email leannew@sharecommunity.org.uk or telephone 020 7801 9825. For more information, contact Leanne Wood, Share's HR, Projects and Volunteer Manager, via email leannew@sharecommunity.org.uk or telephone 020 7801 9825. 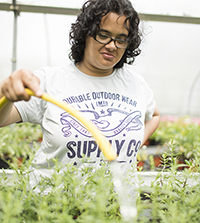 Share provides training and employment support for disabled adults, including those with learning disabilities, physical/sensory impairments, autism and mental health needs. For further information, visit Share's website, email info@sharecommunity.org.uk or telephone 020 7924 2949. If you would like to find out more about enrolling at Share or would like to arrange a visit, fill in our online enquiry form, email info@sharecommunity.org.uk or telephone 020 7924 2949. Copyright © Share Community Ltd. All rights reserved.